Place the sugars and 225ml cold water in a saucepan and bring to the boil, stirring gently. Reduce the heat slightly and boil briskly for 4 minutes. Meanwhile, beat the eggs and salton high speed in an electric mixer for 3 minutes, until frothy and light. With the motor still running, slowly pour the sugar syrup into the eggs and continue to beat for 4 minutes, or until the mixture has thickened. Stir in the nutmeg, vanilla extract and bourbon. Whip the cream until it holds soft peaks; fold into the egg mixture. 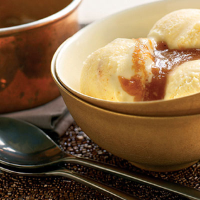 Churn in an ice-cream machine and freeze for at least 3 hours in a lidded container. To achieve a slightly denser, but equally delicious result, pour the mixture into a lidded container and freeze for at least 4 hours, until firm. For the sauce, dissolve the sugar in 100ml water in a heavy-based pan over a low heat. Increase the heat and boil, without stirring, until the syrup is a deep amber colour. Remove from the heat and whisk in the salt, butter, bourbon and allspice, until smooth. Serve warm, drizzled over the parfait. It's got to be a glass of bourbon, perfect for keeping the chills at bay.